[SatNews] AVIWEST announces the company's flagship digital mobile news gathering (DMNG) systems recently enabled 18 broadcasters and production facilities in Spain to provide seamless coverage of the recent local elections. The deployment of 55 units was coordinated by NRD Multimedia, a television equipment supplier based in Barcelona., Spain. Using AVIWEST's DMNG PRO180-RA 3G/4G video uplink system and DMNG Studio receiver, Spanish broadcasters including XAL, V Television, Enfoque, and Quezam, delivered live HD video of election-related events taking place in Catalonia, Galicia, Madrid, and other cities in Spain, while maintaining superior signal quality despite congested network conditions. By providing the broadcasters with a highly portable, lightweight, and reliable video contribution solution, the DMNG solution from AVIWEST reduced video delivery costs while enabling viewers to stay up to date on election news. The DMNG PRO180-RA features eight cellular connections, including 3G/4G internal modems with high-efficiency custom antenna arrays, a built-in Wi-Fi modem, and two H.264 video encoders that enable broadcasters to stream live HD video in the most efficient manner possible with minimal delay. In addition, the DMNG PRO180-RA has eight MCX antenna connectors on its front panel, which can be used to support two AVIWEST QUAD wideband external cellular antenna arrays to strengthen signal transmission in critical environments. Leveraging AVIWEST SafeStreams® technology, the DMNG PRO180-RA assures the delivery of live transmissions even in the midst of unpredictable cellular network conditions. Weighing about 1 kg., the portable DMNG PRO180-RA can be easily connected to any professional camera, whether SD/HD SDI, analog, or HDMI, and mounted via V-Mount, Gold Mount, or PAG plates. Through a user-friendly and intuitive touchscreen interface, operators can easily configure and operate the system as well as communicate with the studio through the IFB return channel. By providing broadcasters with a video uplink system that is easy to transport and use, the DMNG PRO dramatically speeds up newsgathering operations. The DMNG PRO180-RA was used by Spanish broadcasters with AVIWEST's DMNG Studio receiver, decoder, and distribution platform to streamline operations. Utilizing the DMNG Studio, broadcasters can receive up to 16 concurrent incoming streams from DMNG PRO transmitters as well as third-party products such as IP cameras via a variety of protocols such as RTP, RTSP, TS over UDP, HLS, and RTMP. Through the application's intuitive user interface, broadcasters can easily manage a fleet of remote transmitters and dynamically create live broadcast shows by interacting with remote journalists and selecting the stream to publish on air. AVIWEST will also be appearing at IBC2015 with their products on display at Stand 2.A29. "Local broadcasters require remote newsgathering equipment that is lightweight, affordable, and easy to use, in addition to supporting a wide range of networks," said David Cervera, rental manager at NRD Multimedia. "AVIWEST's DMNG PRO180-RA features advanced transmission technology, allowing our customers to deliver high-quality broadcasts related to the election while minimizing operating costs. Our customers especially appreciate that the equipment is intuitive and portable, making it easy to operate on-the-go." "During an election cycle, it is critical to be on the scene of a news story as it happens. If you're a minute too late, the story is yesterday's news," said Erwan Gasc, CEO at AVIWEST. 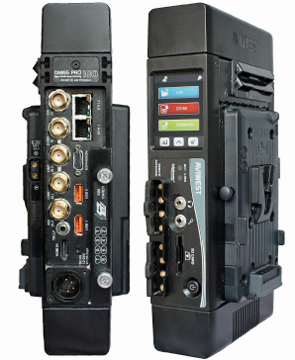 "AVIWEST DMNG systems are specifically designed to support broadcasters in the field. They're lightweight, making them easy to carry, and feature a user interface that is familiar. Leveraging 3G and 4G networks, our DMNG solution enables broadcasters to deliver crystal-clear live news coverage to television viewers."